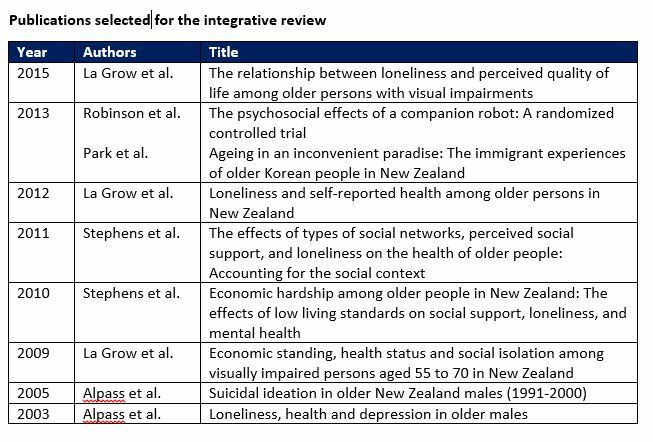 Conducted the first systematic integrative review of empirical studies of loneliness for older adults in Aotearoa/New Zealand; to identify and synthesise what is known in the field. A broad literature search identified 21 potential articles. After these articles were scrutinised against the inclusion criteria, one qualitative and eight quantitative research articles were selected and subjected to independent appraisal and synthesis. Whilst many reviewed articles measured loneliness, only one article studied interventions. Therefore, going forward research is needed "to effectively predict and prevent, and to identify and test evidence-based interventions and community services directed at ameliorating older adults' loneliness." The research findings were consistent with international evidence and suggest overcoming loneliness may positively influence older adults' physical and mental health. For older adults who are visually impaired, they are significantly more likely to report greater loneliness and social isolation. The review did not include grey literature or theoretical literature, and may have missed manuscript in the process of publication. There was some difficulty in choosing a quality appraisal tool that allowed for comparative appraisal of published quantitative and qualitative research. The chosen appraisal tool only had four appraisal criteria, which limited its sensitivity.